This being the 100th anniversary of World War I, or the Great War as it was known until a second great war in the middle of the century made it necessary to refer to it as World War I and the second as World War II. Many historians point out that the two wars were really one great world war with a twenty year ceasefire separating them. Indeed one of the best known, the late Oxford University historian A.J.P. Taylor, spoke of the two wars as the First and Second German Wars. The 100th anniversary of what was the most significant event since the fall of the Roman Empire in the West at the end of the fifth century A.D. has caused a frenzy among book publishers. Numerous books on every aspect of the Great War, from its causes to the failed peace that ended it, have already appeared. We can look for many, many more to come as we relive the war over the next five years. As one who has taught university level courses on modern European history, including specific courses on the Great War, I am not surprised by the sudden interest. Of all the many wars in history the Great War is considered the prime example of the foolishness, the madness, and the absurdity of all wars. There was no reason for the war. None of the powers who at one point or the other became involved in it had any reason for going to war, except perhaps the United States. A victory for the Central Powers would have been a financial disaster for America. Then too, one must add the naïve bungling of an overly idealistic president with virtually no knowledge of foreign affairs, one who ignored the informed advice of his Secretary of State, William Jennings Bryan, to stay out of the war. President Wilson thought he could lead the world into a future where everyone loved everyone and no one was either prideful or greedy. The experienced and more realistic British Prime Minister David Lloyd George likened Wilson to Jesus Christ. From the beginning of the war, historians have debated who was responsible for starting it. It is a favorite subject of academic and popular historians alike. Every year several books appear arguing for this or that one’s responsibility. The consensus tends to be in line with what David Lloyd George said in his memoirs: “The nations slithered over the brink into the boiling cauldron of war without a trace of apprehension or dismay.” Put another way, the European great powers found themselves in a war no one wanted, with victory as the only way out. Many individuals are seeking a book of some sort that will provide a very readable summation of all the varied aspects of the war. 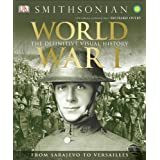 I can think of no better volume than R. G. Grant’s WORLD WAR I: THE DEFINITIVE VISUAL HISTORY FROM SARAJEVO TO VERSAILLES (New York: DK Publishing, 2014). As with all of DK’s publications, WORLD WAR I is a visual feast, a museum between book covers. I can best convey my own enthusiasm for this book by quoting Publishers Weekly: “He [Grant] presents information in an accessible manner and makes it easy to peruse a rich array of articles, detailed maps, and images. The selection of images builds a remarkable portrait of the war. This is a broad, moving, informative account of the war that’s perfect for both the young, budding historian and the well-versed WWI reader” (March 24, 2014). This entry was posted in Book Reviews and tagged David Lloyd George, First World War, Great War, Woodrow Wilson, World War I. Bookmark the permalink. Thanks for the book recommendation. I’ve been searching for a good read. And I love DK books! Always a nice balance between great visuals and interesting text. I think the countries that went to war believed they had good reasons for doing so. Since we are so removed from the events, we can say that those interests were not worth the consequences of the war. Still today, events and solutions look simpler from Washington or London than they do in Baghdad, Kabul, or Sarajevo in 1914. WWI also needs to be put in the context of the previous century. The Ottoman Empire was falling apart. Russia, France, and Great Britain were taking advantage as well as contributing to the problems of the Ottoman Empire. The Dual Empire of Austria and Hungary was also falling apart. What good did Franz Ferdinand think he was doing in Sarajevo? The mutual hostilities of Germany, France, Great Britain, and Russia are well known, and no body had a solution for resolving them. The Triple Entente and the Triple Alliance did no good, and just made the war worse when it happened. The war seems inevitable, although August 1914 didn’t have to be the date. Lloyd George is excusing himself, and more importantly, he is excusing decades of deliberate British actions in Africa and Asia that helped set the stage for war. Thanks for your comments. That some sort of war in Europe was most likely to happen at some point is very likely. That it happened in 1914 and quickly spread from a little war between Austria-Hungary and Germany to a European war and finally to a world war was due to a failure of diplomacy. At least that is what I think.